From surviving ancient manuscripts it is clear that there has always been a belief that new lands could rise up from the ocean, while old ones could sink into the sea, destroying former civilizations in the process. 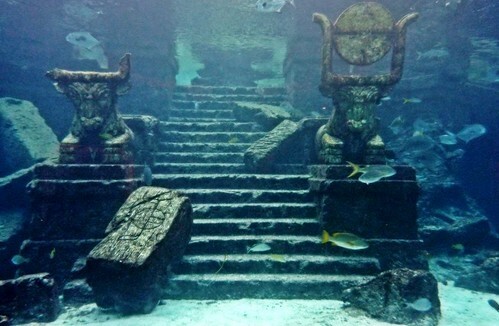 The most famous of all the lost lands is that of Atlantis, described in great detail by Plato almost 2,500 years ago. During the past century as we developed the technology to fly and with the advent of sonar and better diving equipment, numerous underwater anomalies have been discovered. Sites such as the Bimini Road have been probed and discussed at length by many, but not all of the sites are so close to the surface, and often times the depth of the water limits our investigations to sonar images and samples taken by submersibles. In May 2001, it was announced the ruins of an ancient city was discovered in the Gulf of Khambhat. The discovery was made with the help of sonar while routine pollution studies were being done. During the announcement, the site was described as evenly spaced dwellings, a drainage system, bath, granary and a citadel that pre-dates the Indus Valley Civilization. During follow-up investigations, the area was dredged and several artifacts were recovered. Among them were wood (dated ± 7,000 BC), stones described as hand tools, fossilized bones, pottery sherds and a tooth. Among the controversies are that all the supposed artifacts are stones of natural origin, that the “sherds” are natural geofacts and that the dredging could have allowed errant artifacts to be dug up along with the site’s, removing all credibility from the finds. I like how the author just copy/pasted all of their content from another website!